This climb requires a challenging combination of wide crack technique and finger jams. Wear pants to protect yourself on the lower wide section of the route. Up high, a few well-placed hand jams will let you recover before the final moves to the anchor. 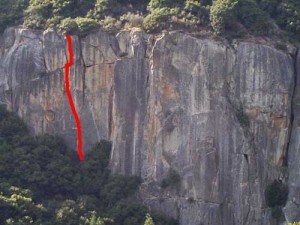 The second pitch delivers increasingly steep finger locks followed by fists. Which SuperTopo guidebooks include a topo for Hardd?